The folks over Seth McGinn’s Can Cooker recently sent over a Bone Collector edition Can Cooker for us to try out. It didn’t take long to figure out that this thing would be an essential part of our camp mess kit. The Can Cooker is a modern rendition of the milk can cooker used since the cattle drives of the Old West. It uses steam and convection to get slow-cooked results in a hurry, and it can do it over just about any heat source, from stove top to campfire. We used the Can Cooker Multi Fuel Cooktop for this recipe and it worked like a charm, even in windy conditions. We will be taking the cooker to turkey camp with us in a month or so. Watch for more recipes in the future. 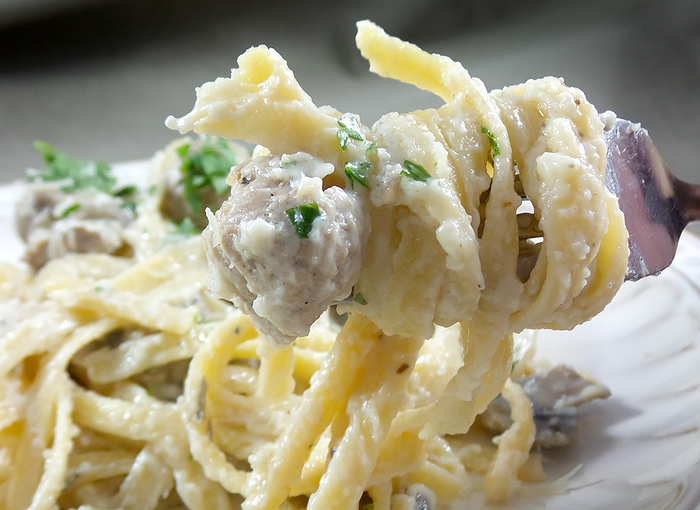 To break it in, we cooked Wild Turkey and Mushrooms Fettuccine Alfredo. With a bit of prep back at the house, this recipe can be finished in about half an hour, making it an outstanding choice for hunting camp. Begin by adding a half gallon of water to the Can Cooker on high heat. Once the water starts to boil, add the pasta and cook for five minutes until it is al dente. Drain pasta and set aside. Season the turkey with Italian seasoning and one tablespoon of black pepper. Move the Can Cooker back to the heat and add one stick of butter. When the butter melts, add the seasoned turkey. Cook for five to 10 minutes until turkey is no longer pink. Add the minced garlic and stir to mix. Add the chicken stock and mushrooms and snap the lid onto the Can Cooker. Wait until you see steam escaping from the vent on the lid of the cooker then reduce the heat to a simmer. Cook for 10 minutes. While the turkey and mushrooms cook, whisk the flour into the half and half. When the turkey and mushrooms have finished cooking, open the lid and sprinkle on half of each cheese, add the half and half and flour mixture and stir well to melt the cheese. Sprinkle on the Butter Garlic Seasoning, remaining pepper and the rest of the cheese. Stir well and return the lid to the cooker. Simmer for another three to five minutes and pour the mixture out into a serving bowl. Garnish with additional shredded cheese and chopped Italian parsley if desired.